The church was constructed in 1877 on the southern side of Dayboro Road between the present Beeville Road and Youngs Crossing Road. 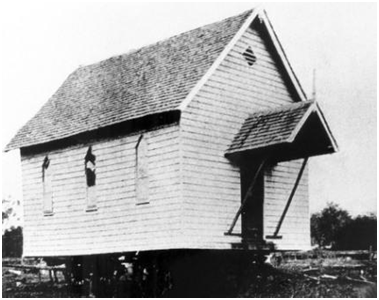 In 1907, the church was mounted on wheels and moved to a new site on Old Dayboro Road in the township. After the move, the church, later known as the North Pine Methodist Church, continued operating in the old building until late 1959. At this time, as the building was in a bad state of repair, work commenced on a new church and the original building was pulled down and re-erected as a hall. Because of increasing population during the 1960s, the North Pine Methodist Church was relocated to the corner of Todds Road and Colleen Street in Lawnton during 1970. North Pine Wesleyan Church being moved to North Pine township, 1907. Courtesy of the ‘Queenslander’, 3 August 1907, p.221.